Main show debut for Eternus. money thrown in. Metaleon again challenged Imposible to a title match. 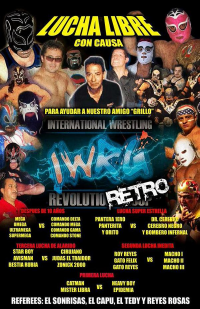 Freelance's first IWRG match since 2013. Pantera (II) may be known as Internacional Pantera now. Suicida hit the referee by mistake twice, earning the DQ on the second one. battle royal rules. 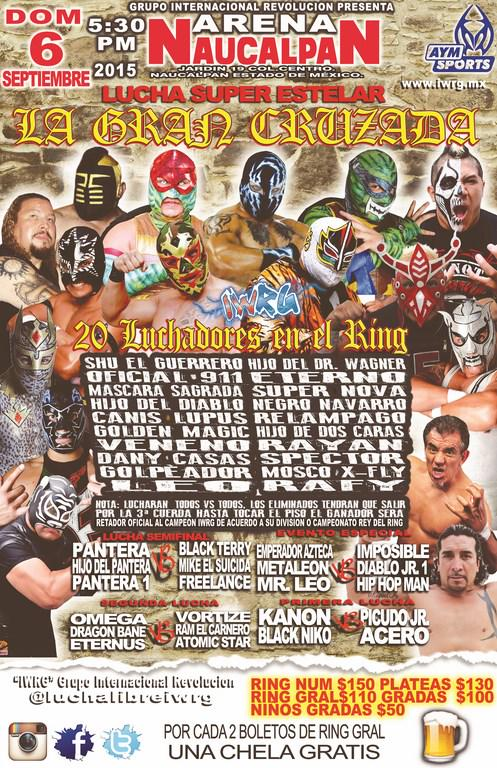 Winner gets a shot at the Rey de Reyes or a title shot against the champion of their division. 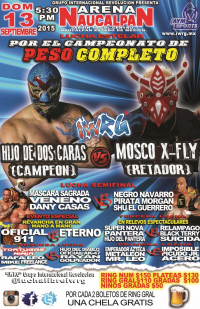 Match came down to Shu el Guerrero (in his first IWRG appearance since 2011) & X-Fly, with X-Fly winning. He challenged Hijo de Dos Caras for the heavyweight title next week. 1) Emperador Azteca, Metaleón, Mr. Leo b Acero, Imposible, Picudo Jr.
Metaleon beat Impossible leading into their title match on the 16th. 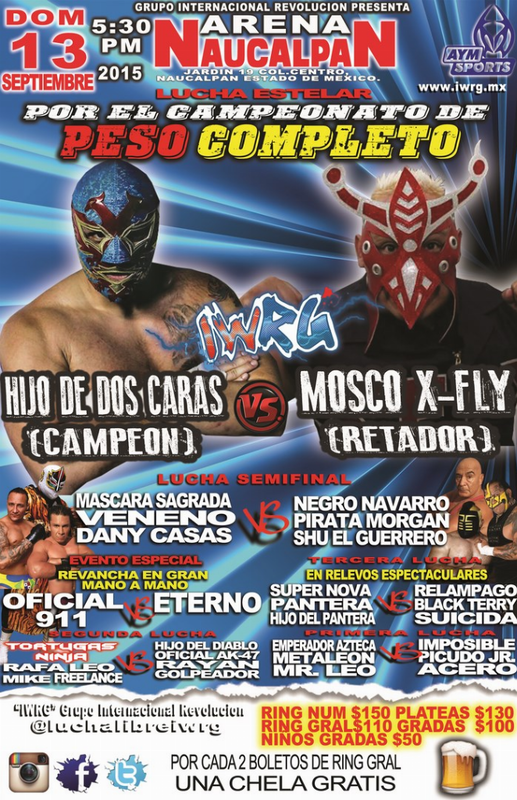 Scheduled main event (X-Fly versus Hijo de Dos for the IWRG Heavyweight title) was canceled due to an unspecified injury to Hijo de Dos. (X-Fly didn't otherwise appear.) 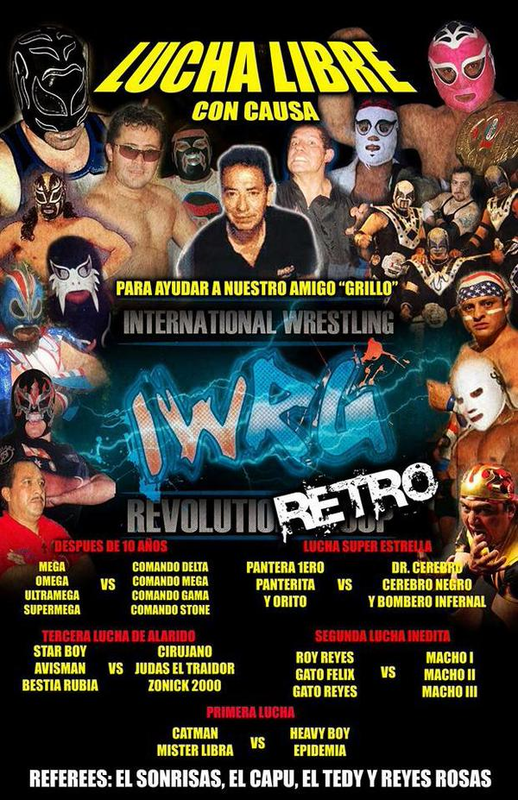 IWRG announced the scheduled 911/Eterno match would instead be a hair match to make up. 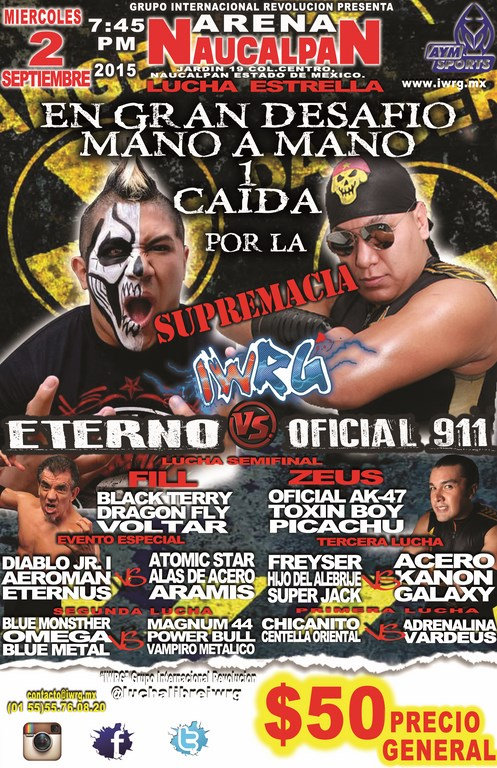 However, 911 also didn't show, so it became Eterno versus AK47. Eterno won in straight falls, first when AK47 was caught fouling Eterno, the last when Eterno was not caught doing the same. 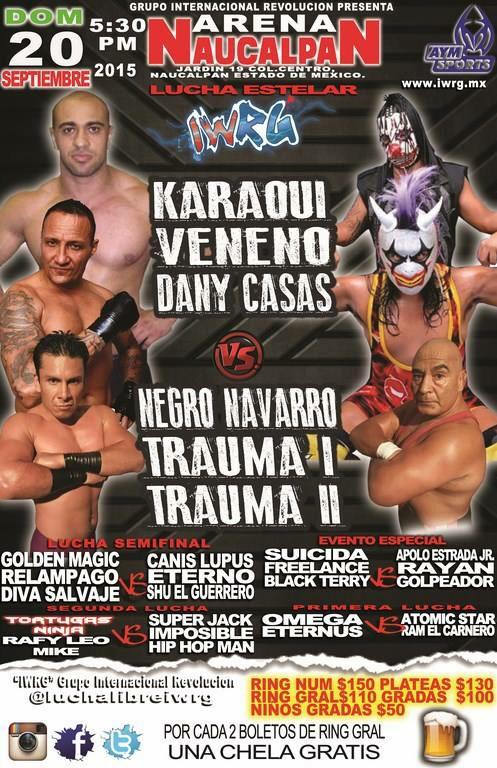 Vampiro Metalico's first match here in a year. 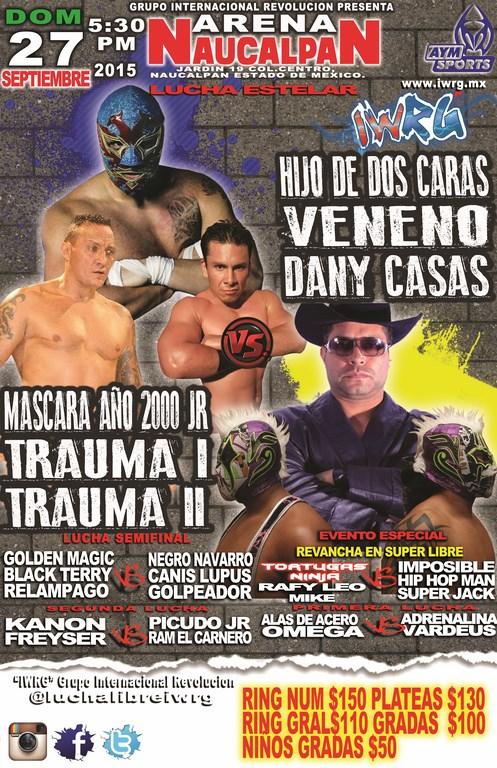 Extreme Fly replaced Dragon de Oro and made his main show debut. Imposible 9th defense. Said to be a good match. 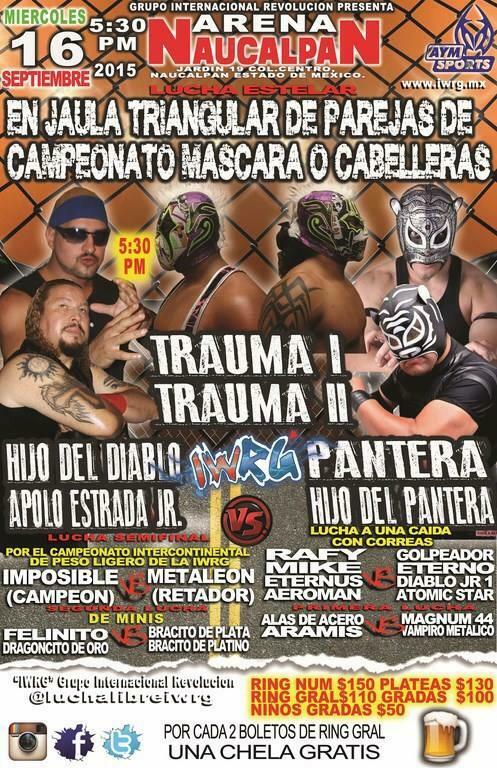 Gringos put up their hair, Traumas put up their masks, and Panteras put up the tag titles. Everyone was required to be in the cage for 10 minutes. Hijo del Pantera hurt his knee in that segment. 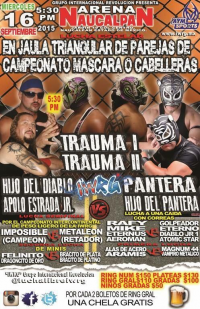 Escapes went Trauma II, Pantera II, Trauma I, leaving the injured Hijo Pantera in with the Gringos. They went after his knee. Pantera II came back in to help, but the Gringos escaped first to win. Gringos won the tag titles from the Panteras. Muerte Infernal & Alfa replaced Omega & Eternus and did not get along. Imposible was taken out before the match started by Leo and was never seen again. Straight falls for the Turtles. Golden Magic suffered a significant wound in the first fall and bled quite a lot. He rallied to get the win over Canis Lupus. They made mask match challenged after the match. The luchadors came to the ring to honor El Grillo. Lots of money thrown in for him, and he appeared to be in rough shape. Orito (Suicida) bled and was beat by Dr. Cerbero, and they made hair match challeneged. Apolo Estrada Jr. replaced Super Jack. Leo & Imposible feuded and talked mask match. Golden Magic pulled Canis' mask for the DQ. Mask match challenges followed. Mascara Jr. snuck on a foul on Hijo de Dos, then demanded his (heavyweight) title back. 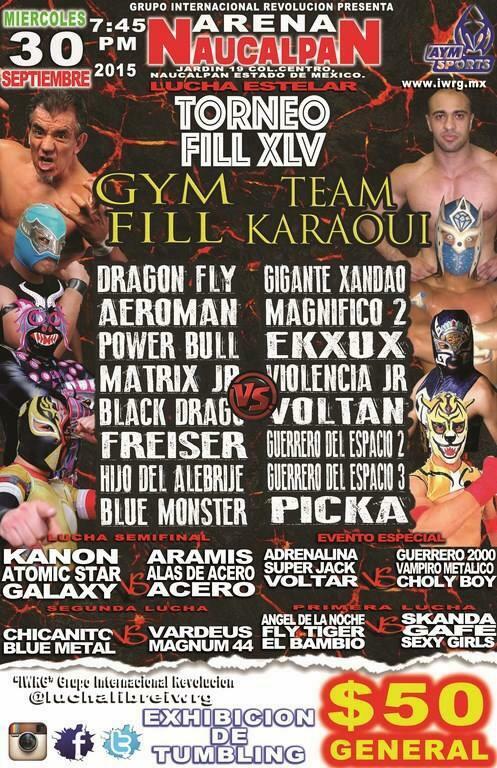 Torneo FILL XLV: FILL (Black Terry) versus Team Heddi Karaoui. Picka & Freiser were listed but did not wrestle. Blue Monther was the first eliminated. Match came down to Aeroman & Magnficio, with Aeroman getting in a top rope Canadian Destroyer. Referee counted three, though it looked like Magnifico got his shoulder up at 2. Terry & Karoui argued after the match.